You've definitely seen pictures of it. It's the one with the atrium skylight and the spiral staircase. 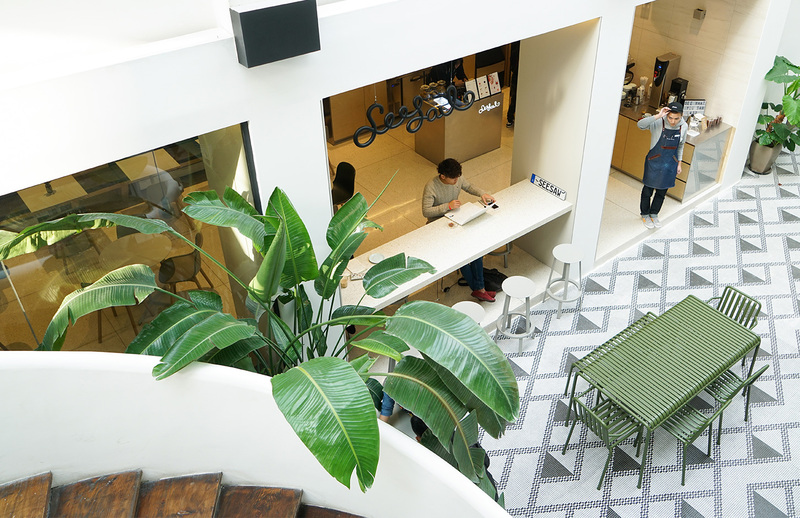 According to a post on their WeChat, the Seesaw Coffee on Yuyuan Lu which launched an empire, is closing Friday, January 18. Opened in April 2012, it's been a staggering 7-ish years, which is like 6,000% longer than most coffeeshops in Shanghai. Also makes it possibly the first wanghong cafe, before wanghong even congealed as a concept. They're giving away free coffee from 9am-4pm, with 200 goodie bags of freshly roasted beans going to first comers. Expect crowds, and people taking pictures. It seems like most of that building there at 443 Yuyuan Lu is going, going, gone, as Yuyuan Lu undergoes a flurry of renovation. Wine Connection closed down last November, while the bay next to it has been sitting empty for more than a year now. "It's not the end of the world but it surely is a blow for old timey (like, 7 years ago) coffee connoisseurs of Shanghai and Instagram lovers. 433 Yuyuan was THE address for good coffee in 2012, when very few people did specialty coffee. Since then, Seesaw spread all over the city and there are now plenty of specialty coffee shops, but it is a tiny piece of city history gone. As it happens."